This book is the all-too-plausible story of one evil turtle and his tyrannical desire to enslave all other turtles to his bidding. If when you read this book it seems to echo eerily close to something you have heard before, that is probably not a coincidence. This is no mere children’s story like the ones you’d find in Aesop’s fables. This is a story with an important moral lesson to teach us and it relates to real life. The villain of the piece is a turtle named Mack who is so dissatisfied with his place in the world that rather than climbing the ladder and making something of himself, he instead blames society for such petty things as the pain in his back and his lack of food. Not content to merely complain, he uses his extraordinary power and privilege to impose his will upon all other turtles. Lacking the gumption and will to raise himself up, he instead only tears down, and will not be satisfied until all other turtles have been brought down to his level. Set against Mack is the tragic hero of the piece, a Randian super-turtle named Yertle who, though born to lowly circumstances on top of a rock only a little bit higher than the station of any other turtle in the pond, raises himself up to be the self-made king of everything up to forty miles away. Because a rising tide lifts all boats, in the process he raises every other turtle in the pond up with him. Even Mack—the greedy, grasping, ungrateful, Mack—is elevated to the very same position Yertle was when the story began, sitting atop the very same rock. If he really wanted to be where Yertle is, there was absolutely nothing stopping him from doing as Yertle did. He was given the exact same opportunity Yertle had. Yertle’s very success proves the existence of upward mobility in the pond. Every single one of the turtles under Yertle only has to look up to find something to aspire to. But when Mack’s incessant complaints and whiny demands do not give Mack any greater reward than he has earned, he brings the whole thing crashing down in the most vulgar way imaginable: he burps. In this one burp, he becomes worse than the Soviets who condemned the Kulaks during holodomor, worse than the people on the street who mouthed the Nazi lies about Jews during WWII. Why worse? Because those people lived in fear of their lives. They had to say what they did because they feared being next on the kill list. But Mack? Mack drags everyone down into the mud and dashes every turtle’s dream of attaining a higher place in society of his own free will. Does he care about the wishes of the turtles above him? No, he does not. Mack imposes his will upon all. In his pond, all turtles are slaves shackled to the ground, doomed to swim about the pond without the benefit of direction or purpose. And in the end, the turtle who had the vision to build a society where any turtle could climb so high as to see forty miles in every direction, where any turtle could through nothing save their own hard work and determination could become king of a house and a cow and a mule, he is down with the rest, only able to see mud. The burping vulgarians of the world cannot tolerate men or turtles of Yertle’s grand vision, and so cannot rest until they are destroyed. Saul Alinsky would be proud. Get more Sad Puppy book reviews (including ones never seen before elsewhere) here! Support the author on Patreon! Well, so much for the notion that this year’s litter of Sad Puppies were kinder, gentler, or even more moderate than last year’s. Over the past weekend, when the initial reactions to their new list were still more initial, Sarah Hoyt posted a response that was… well, we’ll say “typically hyperbolic”, but also quite telling. A lot of it follows the “BUT MOM, I’m NOT Touching Him!” school of legalism that sprouts up whenever reactionaries try to argue with or by what they think is progressive logic, but as she goes on, she eventually compares Puppy critics to such nuanced things as German citizens whipped into a frenzy of anti-Semitism by the Nazi party, only “worse” because those who disagree with the Pups are doing it of our own free will. In the same piece, she refers to those who dissent from her party line as being slaves bound in chains. If you ask the Sad Puppies what their goals are, you’ll get any of a dozen different answers, depending not just upon whom you ask but when you ask them it. The answer changes as needed to suit the needs of an evolving narrative… but you don’t dare acknowledge that it changed. Oceania is at war with Eurasia. Oceania has always been at war with Eurasia. If you want to know what their goal actually is, though, you need only look at how they comport themselves when they’re not trying to earnestly convince you of their goals. Here we see Sarah Hoyt telling us that disagreement with the Puppy platform is the worst crime she can imagine, and equating the freedom to dissent with slavery. Of course, that part of the Puppies’ egos that will not allow them to think of themselves as bad people also will not allow them to admit that they want to quash dissent, that their dream is a world that is marching, if not in perfect lockstep, then almost entirely in the same direction. Sarah Hoyt does not equate freedom with slavery because of some conscious Orwellian master plan to redefine the world, but because it’s the only way she can make sense of things, the only way she can square up the facts on the ground in a way that leaves her on the side of angels fighting the good fight. The Puppies have a certain vision for how the world should look, a certain order to things that they think is natural and inherent and default and good. When the world fails to conform to this vision, there are two basic possibilities, and one of them is too horrible to be contemplated: either the vision is wrong, or the world is. If the vision is wrong, then that’s the end. Game over, time to get a new vision. If the world is wrong, though, then the game not only keeps going, it gets more exciting. Because now there’s an enemy to be fought. Now there’s a problem to be fixed. Now there’s a desperate struggle where they get to be the plucky underdogs doing the Lord’s work against a rising tide of darkness. But however they rationalize it, their “enemy” is dissent and their only victory condition—the thing that will signal they have won and can stop fighting—is a world free from it. Consider: 100% of the evidence they have of a clique (aside from themselves) trying to control the science fiction and fantasy publishing and reading world consists of people making decisions they don’t approve of. People who write or read books and stories that vary from their tastes past a certain threshold are evidence of corruption, because why in a free society would people bother with such things? People who praise those books are further evidence, because how could anyone sincerely praise something of which they don’t see the appeal? If any of those books or stories win awards or are even nominated… well, then, the fix was in, wasn’t it? How else do you explain it? Last year, Brad Torgersen said that he’d be happy no matter what the outcome at WorldCon was, so long as the Puppy campaign succeeded in mobilizing more people to participate. Well, as I previously observed, that happened, and he didn’t seem happy about it. Even though the number of people who voted “No Award” in various category varied by a margin of nearly a thousand votes, the only explanation the Puppies have for the stinging rebuke that fandom issued their movement and their tactics is that it wasn’t the result of free people individually acting their consciences, but rather that the innumerable enemies of freedom had compelled these thousands of people to do so. At one point, we were treated to the pathetic spectacle of Brad Torgersen trying to explain how a particular nominee had felt so frightened of the backlash while she was in the same comment thread telling him and everyone else otherwise. So it’s not that the Sad Puppies have a conscious platform of opposing dissent. It is simply that they believe certain things are so inarguably, objectively true that dissent is literally unthinkable to them. If they see dissent, they will try their level best to “liberate” the dissenter from whatever chains are compelling the dissent… and those who will not be liberated, must be destroyed. All disagreement with the fundamental tenets of Puppydom must come from a puppet or a puppetmaster, after all, and if when they go to cut your strings they discover you have none… well, then you’re obviously a puppetmaster, aren’t you? My recommendation that the best thing to do about their list this year is ignore it still stands. One commenter elseweb suggested that this recommendation amounts to doing nothing about the Puppies, but not so. As Hoyt’s response shows, the greatest threat to the Puppies is dissent, is free people acting individually as according to the dictates of their tastes and consciences. To prevent the Puppies from running roughshod over the process and driving all dissent from the larger fandom, it’s not necessary—or desirable—for you to stoop to engaging with them. It’s only necessary that you continue to participate in the larger conversation and in the process of nominating for and voting on awards, in reading and writing and talking about science fiction and fantasy, in exercising critical thought about what you read and what you write, and basically just actively be your own inimitable self. 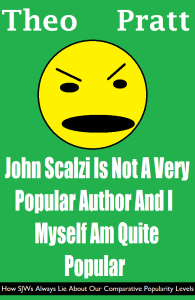 John Scalzi Is Not A Very Popular Author And I Myself Am Quite Popular: How SJWs Always Lie About Our Comparative Popularity Levels. Boasting an impressive 50% more chapter fives than the next leading competitor, this is the only book about the lies of SJW you need to buy this year. Get it for Kindle today! Okay. This is not going to be my usual well-constructed Reasoned Discourse thing, only because I am laughing too hard, and I think that we could all share in the laugh. So, a thing did happen at the traditional Loser Party after the Hugo Awards. That thing was George R.R. Martin, the man who sits upon the Iron Throne of the whole tongue-in-cheek affair that is the Hugo Awards Loser Party, showed up with a sack full of literal, actual vintage car hood ornaments and started handing them out like they were trophies. Get it? Because award night trophies look like hood ornaments? He handed them out to whoever it pleased him to, which I guess included the people he felt had been most hurt by the Sad Puppy shenanigans and the people whose tact and grace had impressed him: the people bumped off the ballot, the people who dropped off the ballot after having been bumped on, the even-handed blogger Eric Flint, people like that. Obviously, this private individual carrying out a touching but still tongue-in-cheek private joke chose to honor people of his own choice. I remind you: sack full of hood ornaments. Not a figure of speech. Not hyperbole or a metaphor. This is old news at this point, though they’re still talking about it. Today I discovered something new. Okay, honored guest and Hugo host David Gerrold made a joke some time ago about this year they’ll have to hand out asterisks with the trophies. So at the pre-party, they had these commemorative coasters, with an asterisk and the Hugo logos printed on, which they gave out to the nominees. It was a gift, not an award. Its meaning was a joke. Some people thought it was a tasteless joke. I think it was a little off-tone and ill-considered, a rare misstep from David Gerrold, but it was not part of the award ceremony. Nobody got an asterisk next to their name on the ballot or in the results. Nevertheless, there’s been some conspiracy-mongering around it, of a similar type to that which surrounded what I’m sure somebody will start calling #HoodOrnamentGate any minute now… well, I say “of a similar type”, but I’ve just learned it’s the exact same thing. There are people out there saying that because the Hugo logo appears on it and it was given to nominees, it constitutes a Hugo Award, one that was issued in defiance of the WorldCon by-laws governing such things. I wonder if there were also gift bags that have the Hugo logo on them? I’m quite sure there were programs and other sundry items bearing the WorldCon and Hugo logos on them. I’m also quite sure that alone does not make something a Hugo Award. So far, it seems to be mainly one person pushing the theory, and the comments on the page are both few and not exactly clamoring to uphold his nonsense. But we can always rely on the good folks at Gamergate to roll up their sleeves and do what no one else will do… which is take the thinnest, most obviously wrong and easily disproved ~*theory*~ on the internet and immediately start touting it as “evidence” of something. Collusion, probably. Notably while the blog post asks the (extremely leading, and also easily answered “no”) question of “Did Worldcon defraud its members?”, Gamergate’s link to it trumpets, “Hugo Awards Under Fire for Disenfranchising Voters” as if this were a factual description of one person, on the internet, asking questions based on false premises. I’d ask how they square this with their insistence on the highest standards of journalistic ethics, but I’ve asked Gamergate about its lack of ethics before, so I already know what the answer is: they’re not journalists, so it doesn’t count. This is the one respect and one respect in which Gamergate is superior to the Sad Puppies. The Sad Puppies are complete and utter hypocrites. Gamergate slightly less so, in that they are honest about their hypocrisy. They fully admit that their goal is to foist what they call ethics on everyone else, not themselves. In short, they come by their dishonesty honestly. Two years ago, Larry Correia started the Sad Puppies campaign with one goal and one goal only: to get himself the award he thought he deserved. He hadn’t exactly been snubbed by the science fiction community, but he never quite got that “it’s an honor just to be nominated” is more than just a platitude. Last year, Larry—having realized that not only wasn’t going to work but didn’t play very well outside his most ardent fan base—decided he really didn’t want a silly award anyway and instead ran the Puppy campaign again with a slightly different goal: to poke a stick in the eye of the people he thought were responsible for denying him awards. This year, he handed off the torch to Brad Torgersen, who tried to powerwash the evidence that the Sad Puppies was nothing more than a tantrum and gild it with a coat of noble paint. The Sad Puppies exist, he says, to bring freedom to science fiction fandom. They have always existed for this reason. Oceania has always been at war with Eurasia. We love Big Brad. The Sad Puppies have come to free us from the people who tell us what we’re allowed to write, what books we’re allowed to like. The Sad Puppies have come to liberate the Hugo awards from the tiny clique of people who have organized in order to control it. Freedom to write whatever we want, though, comes with a responsibility. It means we must not pander. Pandering is defined as writing anything other than what Brad Torgersen thinks is exciting. It means we must not give in to thought police. Giving in to thought police is when we put characters or themes in a story that Brad Torgersen does not see the point of. We can like whatever books we like, so long as they are good books. If we like books that Brad Torgersen does not think are good, then we are either Commissars pushing an agenda by telling people what books to like, or frightened and cowed proles who need Brad Torgersen to free us from the Commissars. And so, in order to liberate the Hugo awards from the small but powerful clique that seeks to control the nomination process, Brad Torgersen assembled a slate of nominees chosen in a transparent, democratic process where he picked the nominees himself, but each and every person involved could see that he was the one who picked them. In order to make sure he sent a message to those people who would try to misuse the Hugos to advance their careers and prop up their cronies, he enlisted the help of internet rabble rouser Vox Day in getting his hand-picked slate onto the ballot, along with Vox, works published by Vox’s publishing house, and works by Vox’s protege writer. Through the midst of all this high-minded liberating that was going on, Brad Torgersen said that his real goal was to shake things up and get more people involved in the Hugo voting process so it wasn’t just the same old people making the pick every year. He said that whether his picks won or lost, no result would please him more than to see more people voting. Well, right away, it seemed like Mr. Torgersen was getting his wish. WorldCon voting memberships started selling like hotcakes. Torgersen et al had a lot of bold predictions about what this meant. Clearly, since the previous situation was that a tiny, insular clique that was out of touch with real people in the real world was manipulating things, the hundreds and then thousands of new people who were putting money on the line to participate must have been The People, Rising Up As One to re-take their award from the tiny, tiny clique that had subverted them. But, Torgersen said, he would be happy no matter who won. WorldCon took place this past weekend. The Hugo Awards were presented Saturday night. The truth is now known. The truth is, Brad Torgersen got his wish in one regard only: there was a record-breaking level of both WorldCon attendance and Hugo voting. He told us he’d be happy if this happened. I’m having a hard time telling from here, but I don’t think he’s happy. Approximately 3,500 people voted for “No Award” over almost any of the works or individuals that the Sad Puppies rammed through the Hugo nomination process. This was not only a victory for No Award, but a landslide. While some Puppies have tried to spin this by saying that their “enemies” the “Social Justice Warriors” were “voting in lockstep” while they, free men and tokens of good conscience, were voting their individual will, the truth is that No Award didn’t just get more votes than any other option, it got more votes than all the other options. The idea that those voters were marching in lockstep is also hard to credit. I’ve seen Puppy supporters saying, in so many words, “What else do you call multiple people voting for the same choice?” I’m not sure they understand how voting works, to be honest. There’s a difference between bloc voting and a landslide, and this was a landslide. At the point where there are enough people for one choice in a field of six to capture a true majority, no trickery or politicking or procedural shenanigans or even much in the way of coordination is even needed. There’s a clear winner. There’s a clear favorite. At that point, it would take considerable cheating for the frontrunner to not win. Now, the No Award option exists in part because the nomination process is not perfect and in part because the idea of the award is not just to recognize the best work in a year but the best work that is deemed by the Hugo voters as Hugo worthy. It gets invoked on at least some ballots in every category every year, as the instant run-off system the Hugos has used allows people to rank their choices in order. If you rank two out of the available five selections in places 1 and 2 and then put No Award in rank 3, you are signaling that the choices below that (or that you don’t rank at all), you’re effectively signaling that you found the first two works award-worthy and the other three not so. What makes an individual work “award worthy”, of course, is highly subjective, which is why every member of WorldCon has the privilege to decide for themselves. And last night, some three thousand people—the vast majority of members who cast votes—decided that none of the works that the Puppies had picked were award worthy, save Guardians of the Galaxy. Now, for eight months, we have heard the Puppies shout about how there’s no rule against doing what they did, about how you can’t simultaneously say something is wrong while allowing it under the rules. Interestingly, this strikingly stark streak of legalism appears to have disappeared completely from the Puppy camps. They have, in the past 36 hours or so, managed to discover how something can be done within the rules and still be called unethical, unfair, and wrong. “They didn’t even read the books!” they yell, never mind that some people made it their very public business to read everything before voting (there are reviews of the Puppy picks all over the web because of this) and never mind that there’s no rule that says they have to and never mind that objecting to their odious tactics and the numerous falsehoods and slanders they have used to excuse said tactics is a perfectly good reason to vote to throw a penalty flag. Some people were assuredly voting No Award on principle (an idea which confuses the Sad Puppies, who are as sure of their moral superiority as they are their literary superiority), but some were voting on merit. All of them were voting as individuals acting their own conscience, which means they don’t have to answer for their votes to anyone. Strangely, the Puppies—who speak of “commissars” they think want to control the vote—think they now have the right to call people to account for how they voted. Strangely, the Puppies—who spoke of wanting to throw open the gates of participation, shake up a moribund sci-fi fandom, and get more people involved in voting for the Hugos—now see something sinister in the fact that more people came out to vote for this year’s Hugos than ever before. All along, Brad Torgersen, Larry Correia, John C. Wright, and Vox Day have been talking about a “tiny clique” of people, a very small and very non-representative minority of the science fiction fandom, who have taken control of the Hugos through secret means, through coordinated bloc voting behind the scenes. The fact that their campaign to stack the ballot succeeded so wildly with only a few hundred participants behind it strongly suggested that they were completely in error about this. The data from the nomination round shows us there was never any actual opposition for them to overcome. Yet now they want us to believe that a “tiny minority clique” that couldn’t muster enough nominating votes to get anything on the ballot against the united camps of a couple hundred Puppies somehow managed to get 3,500 to turn out to vote in lockstep in the final ballot? The Sad Puppies created an unprecedented situation, and they have thus received an unprecedented rebuke. From the beginning, Brad Torgersen’s premise has been that the Hugos have been awarding the wrong books for the wrong reasons. No, no. That’s been your cover story. There are no actual examples of books that won because some hobgoblin lurking in the cupboards at Tor whispered “make it so“. There is no actual evidence that people have been voting for anything other than what they thought was best. There are only books that Larry Correia and Brad Torgersen don’t personally see the point of, thus, whose success must be illegitimate. And, you know, it’s fine for someone to think that. It is. Tastes differ. Opinions differ. It happens. What’s not fine is to take your own personal tastes, use the difference between them and other people’s as “evidence” that someone is lying or cheating, and try to force them on everyone else. This is what the Puppies have done. This is what they promise: as long as the phenomenon of people liking different things than they do continues, they will continue to fling accusations of corruption and steamroll over any attempts to recognize said works. Puppies, months ago, someone gave you very good advice. David Gerrold, a remarkably even-tempered man whose insistence that the ceremony be held with the same grace no matter what any individual presenter thought of the choice was twisted by the Puppies into some kind of weird veiled threat, told you that no one likes the guy who comes to a party and does something nasty in the punchbowl. It’s not political. It’s not even really personal. You just can’t behave atrociously and expect there to be no consequences. I don’t know—and would not fathom to guess—to what extent Brad Torgersen believes the lines of bull that he’s been selling his followers for the past eight months, but at least one part of his narrative should be clearly exploded. If there is an “SJW infestation” in science fiction fandom, it is not a tiny minority that tenuously holds to power by operating in the shadows, and shining a light on the “rot” will not rally the people, “the real fans of real science fiction” against them. There has been more light shining on the Hugos this year than any year before. Brad Torgersen has had more eyes on his blog, I’m sure, than ever before. Every time he got media exposure and someone new showed up at his blog or in the comments of the blogs of one of his cohorts, he would crow about how even the negative exposure just swelled his ranks. Now he knows: for every one or two people who were swayed by his words, there were scores of people who looked at what he was selling and not only didn’t buy it, but felt compelled to put their money down for a membership just to stop him. I said on Twitter that I doubt very much all 3,500 No Award voters were liberals. I believe this to be true. I don’t think a single end of any political or philosophical spectrum has a monopoly on not liking bullies coming in and telling people what to do. I don’t think conservatives have more patience than liberals with people who come in and say that they don’t like the way a game is going so they’re going to keep turning over the gameboard until we let them win. While the Puppies’ rhetoric might attract more conservative sympathy on the surface and while it certainly has a tendency to repel liberals—both by design—I don’t think the ability to see through the rhetoric is the exclusive province of the liberal. Strangely, the Puppies seem hellbent on painting everybody who voted down their agenda as members of that tiny, insular, ultra liberal clique they claim to be here to save everyone else from. They would rather believe that their designated enemies are innumerable than face the fact that the people have spoken against them. Many have predicted that next year’s Hugos will be even uglier. I’m not making a definitive prediction, but somehow, I don’t think so. I do think that we might see a bit more politicking and coordination during the nomination process, as people will understandably feel that the only way to have their voice heard post-Puppy is to join a bloc. In this respect, the Puppies have created the monster they claim to have come here to eradicate. Pending rule changes for the year after that will dilute the impact of bloc voting, if they are ratified at the next WorldCon. But we have seen that the Puppies were not only wrong, they were exactly wrong. Their great big power play has revealed themselves to be the insular clique: small, out of touch with both broader science fiction fandom and reality more generally, yet feeling entitled to complete control of the playing field. We know that the vast majority people see right through their nonsense, and are willing to stand up and counted to say, “No more, enough.” And while this has been a bad year for the award ceremony, I think history will remember it as a good year for WorldCon, because it did get more people involved, it did sell more WorldCon memberships, and it did spread awareness of how the Hugos are awarded and it did raise interest in the process. If the Puppies, in their desperation for something they can claim as a victory, can’t find any solace in that, then I don’t know where they’re going to get it. So, the retro-wonderland video game Terraria received a massive content update at the end of June. I didn’t get around to checking it out until like last week, but I spent enough time playing it over the weekend to get full-blown Tetris Syndrome over it, with neat rows of terrain blocks artfully arranging themselves behind my eyes. Sometimes described as being a side-scrolling Minecraft clone, Terraria sometimes feels like a video game designed with someone exactly like me in mind. Dynamic lighting and particle effects aside, it looks a lot like the video games I grew up with. It’s what I consider to be a true sandbox game, which means it’s not just an open world for exploration with limited sign posting and required goals, but it’s meant to be reshaped and built in. In fact, it’s darn near what I imagined the future of video games would look like, back in the early 90s: looking about the same but shinier and you would be able to do so much more stuff. A little background: Terraria starts by dropping you into an idyllic pseudo-16 bit paradise, where a cartoony Final Fantasy-ish looking character stands in a forest meadow surrounded by trees and bunnies. It’s less muddy (and far prettier) than the more famous Minecraft, but the basic idea is the same: day is relatively safe, the night is dark and full of terrors. You spend the daylight hours gathering materials and exploring, then dig in for the night with a simple shelter. As you gain more materials and gameplay familiarity (there’s no in-game experience or skill system), your simple shelter might become an elaborate castle, secret underground base, mansion, or town, and your tools for dealing with the horrors of night or the monsters lurking underground become more powerful and sophisticated. The game does not have a linear progression, but nevertheless, it does progress. The quest for more and better stuff takes you into more dangerous environments with new threats. Random events can make the monsters more numerous and/or more monstrous. Horrible-looking screen-hogging bosses lurk in the background, appearing when the player accidentally disturbs them, deliberately summons them, or in some cases just grows too powerful. Defeating these leviathans results in fundamental shifts in gameplay, by giving you access to new materials and in some cases new areas to explore, but also unleashing more horrors and wonders into the world. The most recent content updates to Terraria are much less geared towards me in particular as a consumer, as they are largely concerned with extending out the “end game” with more challenging content. See, the game is “over” in the sense of there being nothing new under the sun when you had beaten the last boss, achieved the best armor, and built a town or mansion big enough to house all the friendly Non-Player Characters. That’s the point where people who play a game to completion tend to feel like there’s nothing more to do, whereas it’s the point where I feel like I’ve collected all the toys and it’s time to start playing for real. The new updates do add more toys, but they’re mostly focused on creating the equivalent of new challenge stages for people who have beaten everything else: new events to live through, new invasions to fight off, new bosses to summon and beat. I’m not saying that’s not fun, but it’s not what I’m there for. I don’t think it’s a coincidence that the times in my life I’ve been most into Terraria have been the times that I have felt the most powerless, the times that I have had the most emotional turmoil. Real life is complicated and messy. Terraria is neat and orderly. While people in real life cling to aphorisms about how the creator of the universe never gives you a challenge that you can’t stand up to, this is literally true about Terraria‘s dynamically generated world: it is a world full of problems, yes, but they’re all problems that are not only ultimately solvable, they are engineered to have solutions that are within your grasp. Sometimes I see the meme circulating within Gamergate that anybody who takes on “gamers” is a fool because gamers are winners, because they have more experience with persevering over defeat and fighting losing battles than anyone else. There are many things wrong with this mindset, not the least of which is the idea that Gamergate represents the whole set of “gamers” and people who disagree with them (or haven’t heard of them, or don’t care) haven’t shared in those same experiences. But the idea is also foolish because the challenges that Gamergate is used to overcoming are overwhelmingly stacked in their favor. Even the games that are designed to be devilishly difficult, to appeal to people who want a challenge, are generally designed to be just challenging enough to sink emotional hooks in the player and compel them to keep trying. When a game’s story tells you that you are struggling against impossible odds, that’s the story. The game is there for you to beat it. The obstacles within it are there for you to overcome. And with very few exceptions in the modern era, death and failure are a temporary state that are effectively retconned away as soon as they happen. Even in games with no finite lives/continues or “permadeath”… you the player can still start your game again, even if your actions resulted in the death of the character you were controlling. That’s not how it works in real life. Even if Gamergate is not exactly a life-and-death struggle, it is still possible to fail so badly at a thing that it impacts your chance of future success. The saying “You only have one chance to make a first impression” applies here. The gator-based assumption that everything they do—every attempt at something like re-branding themselves—should be and must be judged in a vacuum, it reflects this disconnect. The faith they have that their time spent gaming will translate to real life has given them the expectation that trying again means their previous failures need not be addressed. It’s a fresh try. I think older gamers, those of us who played games during the awkward transition between the quarter-eating devil machines of the arcade era and the development of the home market, might have a more realistic perspective. Certainly those of us who played adventure games that could be rendered unpredictably unwinnable by a single wrong move in the opening scenes have a pretty solid understanding that a thing can be so small and so random and yet still screw something big and important up so badly that it can’t be fixed again. My older brother had a boxed set of The Ultima Trilogy, the original Ultima and its first two sequels. The second game was the one most interesting to us, as we’d already played the NES port of Ultima III and Ultima II, with its greater focus on time-and-interplanetary travel and conceit of exploring the real world was just… well. It was amazing. Or it looked amazing. But the second game, unlike the other two, would only save one character per disk. And it included no mechanic for deleting your character and starting over. I mean, nowadays I know that anyone with a sufficient knowledge of DOS could delete the save file and/or copy the disk used for saving, but these things were not intuitive to us at the age of ~8. So what happened was my brother started playing a game, and he saved it at a point where he was low on food (running out being a loss condition) and in no position to get any more. And that was it. We could run Ultima II. We could walk around a little bit before starving to death. That was the whole game as we experienced it. Playing Ultima II in DOS taught me that you can screw a thing up so badly it can’t be fixed and all you can do is wander around watching the inevitable slowly fail, a lesson that Gamergate doesn’t seem to have ever learned. Terraria is not a coin-op game ported directly to consoles. It’s not a text adventure. It’s not a game designed for a narrow niche of expert hobbyists who can be expected to do their own file management. It’s a modern game, designed for modern sensibilities, and all the problems it gives you are ultimately solvable. When the orderly world it presents is infected with chaos, you are given the tools to beat back the rising tide. You can fight off the monster hordes. You can purge the world of the eldritch infection that threatens to swallow it whole. You can put the sealed evil back in the can. And while you’re doing this, you can re-arrange the world to your liking. My current self-directed goal in the game is to rid my generated world of crimson, a body horror-esque element represented by a biome made of bloody tumors. It has a chance of being present in your world at generation, and it spreads… slowly at first, then at the main turning point in the game’s progression, it makes a huge leap across a large swath of the map and then spreads much faster. The spread of the crimson (or the corruption, the cosmic horror equivalent that will be present instead if the crimson isn’t) makes the game much harder, and its progress seems inexorable, especially when you realize that not only can it spread directly but it will pop up in random, out-of-the-way places in response to certain actions. But the thing is, the world of Terraria is finite, contained within boundaries that a human mind can easily conceive of and explore. Anywhere the crimson can pop up, you can get to. And you have tools to fight it. You can root it out. You can purify it. You can blow it up. You can blast a trench to hell in order to cut off its spread. You can spray a cleansing solution in a circle around you and clear whole screens at a time. You can watch the map of the world as you’ve explored it for places turning red that were previously green or gray. You can hunt it down. It’s not easy in the sense of being something you can push a button and fix it. The quickest, surest solutions are probably also the most tedious in practical terms. The in-game reward? Doesn’t actually exist. But it’s a goal, and it can be reached. It’s a problem, and it has a solution. Ultimately, of course, success in a video game means as little as failure does. I can wipe the crimson off the face of *this* map, but not only are no lives actually saved or changed or touched in any way by this feat, but it still exists in thousands and thousands of other Terraria maps extant in the world. And as soon as I start another game or take my character to another map, it’ll start up again. I know this. But while video game problems and their solutions are completely immaterial in the strictest sense of the world, there’s still something compelling about them. In real life, the world around us is unfathomably vast, unknowably opaque, and unspeakably complex. You cannot solve the world. You cannot beat the world. But just load up a copy of an old Mario game and you can beat eight worlds in a leisurely afternoon. The Goblin Emperor: Yes, it’s fantasy, and yes it’s a novel. So, back on June 19th I purchased an ebook of the Hugo-nominated work The Goblin Emperor (by Katherine Addison), but it being a sort of hectic and tumultuous time in my life I didn’t immediately read it and then even forgot that I had bought it. Last week, I got my first library card as a Maryland resident in order to take advantage of their ebook lending library for distracting me during a flight back to Nebraska for multiple family events. The e-library is great, but even more so than the physical library it’s kind of a “take what you can get” situation if you need something to read and can’t wait, as they only have licenses for so many copies of each book. This is how I ended up checking out World War Z, a book that I’d always been slightly interested in reading but had never actually picked up. When I opened my Kindle app to download the book, I was surprised to find The Goblin Emperor (I had forgotten about it, if you remember) already waiting for me, so I read it first. Having read these two books one right after another was important, for a reason I’ll get back to. Anyway, in a year when many Hugo works were nominated whose merits are so dubious that even the people who nominated them aren’t discussing their merits, The Goblin Emperor is a novel whose merits have been rather sharply debated. It has been praised highly from a wide number of quarters, but there are some lines of criticism that have cropped up and been repeated even outside the quarters of the Puppy campaigns (though they are found most often and most vociferously within those quarters). It’s not really fantasy, so much as an alternate history with non-human races because there’s no magic or other speculative element. The standard Puppy nonsense of “SJWS ARE SHOVING MESSAGES DOWN OUR THROATS AND VOTING FOR STORIES FOR AFFIRMATIVE ACTION REASONS” has certainly come up, too, of course, but it’s hardly worth engaging with them. Now that I have read the book, I really have to wonder: did the people making those two criticisms of it do so? If they did, I don’t think they could have read it carefully. While the vision of elven and goblin societies in The Goblin Emperor are an example of intricate and engrossing worldbuilding, the magic-using classes of society appear to have been lifted straight out of classic D&D; e.g., there are clerics and there are wizards. If you need someone to speak with the dead, you call a cleric, just like you would in a D&D game. The book makes it clear that this sort of thing is a bit passé in the modern world, but a major subplot (and the resolution of the main plot) revolves around the fact that it is a thing that clerics can do. And if people aren’t calling on clerics for miracles routinely, magic is still such an integral part of elven society that the emperor is expected to be accompanied by a wizard literally everywhere he goes. And I mean literally everywhere. The emperor does not go to sleep without his bodyguards, one fighter and one blue-robed, magic-slinging wizard, there with him. The book understandably elides the toilet habits of the emperor, but the refrain about the emperor having no privacy and the bodyguards’ reaction to the few times he requests it makes it clear: they are there all the time. Since the book opens with the titular character becoming emperor and he’s enthroned very early on and the book never strays from his point of view, this means that upwards of ninety percent of the book contains one of the few wizard characters who occupy the position of Wizard-Bodyguard, and these characters are referred to constantly. Now, they’re not casting magic constantly. They are there to protect the emperor’s life, which means they don’t use magic frivolously, for entertainment or convenience or comfort. Two spells are cast by our blue-robed mazei (the elven term for mages, apparently) in the course of the book, but they’re both unambiguously magical and also things that would be associated with wizards in D&D: a sleep spell and a lightning bolt spell. So that’s a lot of mention of wizards and very little wizardry, but it’s also unambiguously “real” magic, not “Well maybe it’s all hocus-pocus and the power of suggestion” magic. Also, in Terry Pratchett’s Discworld, the chief duty of a professional wizard is to not use magic, yet few people suggest it’s not really fantasy. Because the book uses invented language to refer to concepts that hold important places in elven society, I can forgive people for not immediately catching on that the blue-wearing order of people who supply one half of the emperor’s traditional bodyguards are supposed to be actual-fantactual dyed-in-the-robe wizards the first few times that they’re mentioned, especially since the included glossary is 1) in the back and 2) oddly incomplete when it comes to the subject of the wizards and their order. But by the time they’re mentioned to be casting “cantrips” and throwing lightning bolts around? Well, I can only really conclude that the aforementioned critics did not read the book that far. Both of those events are also moments of pivotal plot development/revelations, which might also do something to explain why so many of the same critics were not aware a plot was there. The plot criticism… well, when I read those types of comments, including by people who were otherwise defending the book, I was prepared for a non-traditional plot structure, which I’m okay with. But actually, the book’s plot is rather conventionally structured. The conflict is not, as some have said, “Protagonist vs. Self” but rather “Protagonist vs. Villains”. The character does grow and change and come to the sort of epiphanies that some people believe marks a plot. From the first page, there is a mystery that is gradually unraveled over the course of the book. Moreover, far from being a “series of anecdotes”, the book’s narrative flows unbroken from the moment we first meet Maia on the first page until the end. I’m not saying there aren’t any moments fast-forwarded over, but that they are fast-forwards and not jump cuts from an arbitrary stopping point to an arbitrary starting point. Every time the clock or calendar is advanced, it’s for a reason, taking us from one plot-relevant scene to another. I suspect that other than “just not reading the book to begin with”, the reason I’ve seen more than one person saying the book is plotless is because they did not understand the plot, because while it was conventional in its structure, it was unconventional in its presentation. The title character, an outsider suddenly elevated to the role of emperor of the elven lands, has to rely on others to provide him with information, carry out investigations, et cetera. So while he drives the plot, he does so indirectly and then often learns the results of the things he sets in motion secondhand. The book is a political thriller in the purest possible meaning of the words, where the viewpoint character is not an intrepid reporter or secret service agent or military intelligence specialist but a politician, or at least a political leader. Because of the conceits under which Addison was writing (that we don’t stray from the emperor’s point of view, that the emperor is trapped by his role and forced to rely on others, et cetera), the resolution of the actual main plot is largely anti-climactic and the book continues from there through a coda that allows our hero to have a more personal triumph that hints at the nature of his likely long and successful reign. Perhaps this decision contributed a bit to the feeling of “not a novel, just a series of events” that some people complained of, yet the plot was there. And while people have complained of the similar codae to the Lord of the Rings, I’ve never yet heard anyone claim that the decision to show what happens after the plot is resolved robs Lord of the Rings of its essential story-ness. And that brings me back to World War Z. Years back, people criticized Rachel Swirsky’s nomination for “If You Were A Dinosaur, My Love” in the category of Best SF/F Short Story under similar grounds: that it wasn’t a story as such, merely a vignette. It was likewise criticized as being not worthy of that Hugo category for not being a “real” fantasy story, a subject I’ve dealt with before. The fact that these two Hugo-nominated works were both criticized separately on the same grounds is something that has bugged me before, but then I read World War Z back-to-back with The Goblin Emperor, and now it more than bugs me. Because you know what is literally “a collection of anecdotes”? World War Z. That’s the format that the book takes. And yet I doubt anyone who has read it would question that it tells a story or that it constitutes a novel and not, say, a collection of short stories. You know what else is more of a collection of anecdotes than a self-contained novel? Any given book in the A Song of Ice and Fire series. Sure, we can understand that they’re all collectively telling one story, or something that will be seen to be a single story when it’s completed. We could say they have many plots instead of one plot, but even then we’re stuck with the fact that this plot over here might have begun in this book but doesn’t end until that plot, and so on. It might be that this is only the case because absent an honor being awarded for something that is specifically a novel (or in the case of “…Dinosaur…”, a short story) there’s no point in splitting such a hair, but I suspect that if any of these or several other works that take a vignette/mosaic/what-have-you approach to storytelling were nominated there wouldn’t be anyone trying to refute their eligibility based on trying to pin down an objective definition for a unit of storytelling. Because this kind of scrutiny is so ridiculous and so pointless that it only crops up at a noticeable level when there’s another purpose being served, such as gatekeeping. Katherine Addison is a woman who wrote a novel that made it onto the Hugo ballot on its own merits. Rachel Swirsky is a woman who wrote a story that had a radical pro-SJW message shoved down our throats. Nota bene: I still have yet to find anyone who can explain what message it shoved down my throat, but I have been assured that it’s totally there. People question the legitimacy of these works not because they have any kind of deep and abiding respect for the sanctity of the terms “novel” and “short story”, but because they object to them. They object to their existence, to the fact that they have received positive notice. Puppies and others saying that “If You Were A Dinosaur, My Love” isn’t a story and The Goblin Emperor isn’t a novel is not that different from Gamergate saying that Gone Home isn’t a game. The point is to explain away its success as irrelevant while also trying t head off any further success. I am not a Hugo voter, but if I were, I would totally be voting for The Goblin Emperor for best novel. It is not a perfect book. Despite having been pinned with a reputation for being a “Social Justice Affirmative Action Message Book” or whatever the puppies call it, it does suffer from some of the most common missteps in fantasy dealing with race. The decision to hide all information about pronunciation, translation, and pronoun casing in the back of the book also affects its readability, particularly in the electronic edition (where flipping from one point to another is trivial, but flipping ahead is a good way to irrevocably lose your place). Yet for these faults, it’s a great book and it got there on its own merits. It could have been a bog standard “D&D World With The Serial Numbers Filed Off” but it’s so much more than that. I understand the point of view of people who are voting No Award for the entire ballot on the principle that voting any other way legitimizes the Puppies’ tactics or on the principle, but I believe in the case of the Best Novel category, voting for a work that made it on despite their machinations rather than because of them would not carry such an unintended message. Note: A previous version of this post reflected that The Goblin Emperor replaced a withdrawn work on the ballot. This was an error of my own memory that was caught by multiple commenters, and the post has been edited appropriately. Apologies for the mistake. Writer, reviewer, and tech blogger K. Tempest Bradford made waves earlier this year when she announced a challenge she was undertaking for herself (and suggesting for others who felt like doing it): to only read stories by authors who are women, or people of color, or queer. Now, a number of people have misinterpreted her criteria as being way more narrow than they are, thinking that she won’t read any stories by white people or straight people, but the criteria are “or”, not “and”. A number of other people have decried it as discrimination or a call to arms or misinterpreted it as a boycott. The most concise defense of her decision I can offer is the fact that after she started doing it, she realized that whole issues of some magazines were out of bounds. This is the point: in the absence of a concerted effort to seek out voices that don’t belong to straight white men, you can wind up reading nothing but straight white men without realizing it. Anyway, the actual challenge Tempest lays out isn’t for people to read the same books that she reads or to use the same criteria she has laid out, but to think about who they are reading and make deliberate choices. She suggests defining some criteria and sticking to it for a year. I’m not doing that this year. Not with prose fiction, anyway. But I did make a decision late last year, around the time of the winter Steam sale, that during the calendar year 2015, I would not buy any video games that do not allow you to play as a female character. I might have tweeted about it, I don’t recall. I didn’t make a whole lot of fanfare over it, though. It was largely a personal decision. I’ve decided to publicize it, though, because the concept of “voting one’s wallet” means more when 1) more than one person is doing it and 2) there’s some means for the industry being targeted to know on what basis people are making their buying decisions. So here it is: for at least the space of the calendar year 2015, I am not going to be buying any games that do not allow me to play as a female character, and I invite anyone who is interested in shaking up the status quo to do the same, and to make their decision known. Now, there’s some room for interpretation in how the challenge plays out. For instance, a game like Don’t Starve has a male default character and only allows you to play as other characters (female ones included) as you progressively unlock them. To me, this is acceptable. If it had an open-ended character creation system that arbitrarily restricted you to one gender before you “earned” the right to play as another, that would be kind of a slap in the face, but each of the characters in Don’t Starve is a unique individual, half of the available characters are female, and you can unlock the first female one pretty quickly. That’s my call on a game like that. There are also games that have multiple protagonists that game play switches between. If a game like that has at least one female character, does it count? Well, that’s your call. What about games in long-running franchises that revolve around a single established character who happens to be male? Are they exempt? Also your call! I certainly play games like that. I wouldn’t buy one this year, but I understand the temptation to give them a pass. The reason I’m not doing so is the fact that there are so many “legacy” franchises like that, and so few with iconic female characters. Also, so many long-running character-centric franchises have added female playable characters that there’s not really an excuse for the holdouts. It’s also your call, on games that have multiple predefined characters to choose from, on whether any level of female representation is acceptable or if there needs to be something at least approaching parity. I bought the new Gauntlet game, even though male characters outnumber females by 3 to 2, and you have to pay extra for the second woman. That was my call. You can make your own. On the subject of Gauntlet, where I am more likely to play as Questor the Elf than Thyra the Valkyrie just as a matter of playstyle, so I should make it clear: it’s not that I insist on only playing games as a female character. It’s that I insist on the option being included. I am very happy that each successive game in the Borderlands franchise has moved closer to parity between male and female characters, but I like to play through them with each character at least once. My current playthrough of the first game is with Mordecai. I know that some people (e.g., gators) will say that I am trying to dictate how game developers make their games and thus something something underpants gnome logic something censorship something anti-art. Nothing could be further from the truth. I don’t owe anyone my time or money, and like anyone else, I have the freedom to let my preferences be known. The status quo of the supposedly free marketplace of ideas already restricts artists to working within a narrow palette of ideas, which is: whatever seems profitable enough to be worth the effort and resources. I’m just letting any interested artists know where my money is, in case they want a piece of it. That is free speech and the free market in action.